Never underestimate the value of having a designer with your project. Their expertise goes well beyond picking out countertops and paint colors. Unfortunately, when you have a project and are looking at ways to cut corners, the elimination of the designer seems like a no-brainer way to save money. But you better watch out — you may end up spending more. A work colleague of mine once said, “Everybody thinks they have good taste.” This is so true! We individually know what we like, but quickly turn down our noses at others who do not share our own design acumen. Because we all think we have good taste, there is a fair amount of us that forego using a designer. This ends up being the first of many mistakes in the project, resulting in wasted time and lots of headaches. True story: a friend embarked on a kitchen remodel alone; not using a kitchen designer. She thought that since this was a “small remodel” – just new cabinets, new appliances, new countertops and new flooring, but all within the existing kitchen footprint – that she could easily manage it herself. All seemed to go perfectly, up to the day when she had her new appliances installed. She was so excited that she was getting a new bottom mount style refrigerator to take the place of her old side-by-side. 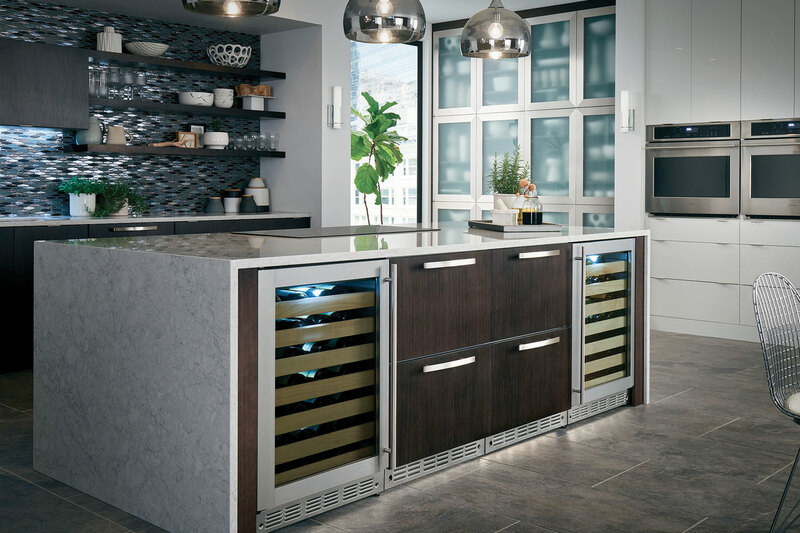 As soon at the installers put in her new refrigerator, she pulled out the bottom freezer drawer, only to have the front handle of the drawer collide with the new cabinetry on her kitchen island. She never took in to consideration that the freezer drawer would pull out further than her side by side doors did. Result? She had to move the island, which had already been permanently attached to her new floor, 12 inches which caused damage and needed repair to the island and to the new floor. A kitchen designer would never have let that happen. Ahhhh. Now that’s mental health. Building a kitchen? You still need to eat. Kitchen remodels are not the fastest of home projects. They can take weeks, even months, to complete. This is why one of the first things you need to do is to get with your builder or contractor and figure out where you are going to locate your temporary kitchen. This is not a time to worry about the aesthetics of what this temporary kitchen looks like or where it is located (garage, basement, hallway…). This is about functionality. This is about maintaining family harmony and your sanity. At a minimum, you’ll need a refrigerator. If you are replacing your current refrigerator with a new one, use the old one! Your builder can haul it away during the punch list phase. Close to the refrigerator, you will want your coffee pot. No need to go cold-turkey just because your home is practically a construction zone. Next, think about having a microwave and possibly a small single burner cooktop. There are some nice, safe ones out there…much more than what a Bunsen burner can do. For those that have outdoor grills, take full advantage of that grill and learn how to make new and different foods. Have you ever tried to cook a pizza on a grill? Grilled sandwiches? Bake a pie? The possibilities are endless. During a kitchen project, going out to eat day after day becomes a drag on your psyche, your waistline, and your kitchen budget. Plan to have a temporary kitchen to handle simple meals, or at a minimum, keep food and drink staples in the house. Is your kitchen is a little dreary, outdated, and not quite meeting the needs of your busy family? Do you have a vague concept of a “kitchen remodel” but the actual image of your new kitchen is a little blurry in your mind? Once you make the decision to start planning your kitchen renovation, where do you begin? I’ve got the answer for you! Let me introduce you to the most amazing resource for design inspiration and expertise – Houzz. If you’re looking for overall design inspiration, Houzz is the place to start. Design professionals, including designers, architects, builders, brands, etc., post many photos of their projects, with details and key information you can use to help plan your remodel. You can create an Ideabook for each room you’d like to renovate and add photos of spaces that inspire you or even images of the small details you need to consider. As you move along the design process, the Houzz community is one of your best resources. You can ask questions about specific products you’re considering, a detail you’ve seen in another Ideabook, or even just design advice. Interested? Time to check it out! 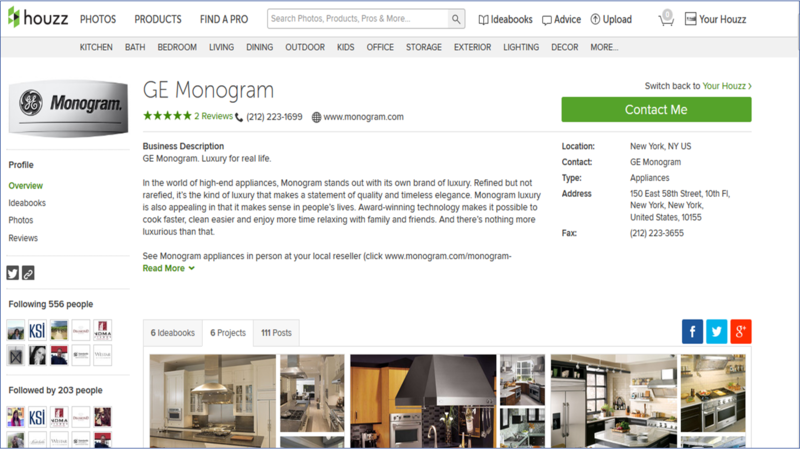 You can even find GE Monogram on Houzz if you’re curious.